Research Interest: General Microbiology, Applied Microbiology, Environmental Microbiology, Waste Water Microbiology, Fermentation Microbiology, Molecular Microbiology, Biochemical Engineering, Molecular Genetics, Cellular Microbiology, Bio Remediation, Bio Degradation, Environmental Toxicology. Biography: Dr. Maulin P. Shah, currently Chief Scientist & Head – Industrial Waste Water Research Lab, Division of Applied and Environmental Microbiology Lab at Enviro Technology Ltd., Ankleshwar, Gujarat, India, received his Ph.D. (2002-2005) in Environmental Microbiology from Sardar Patel University, Vallabh Vidyanagar, Gujarat. He has served as an Assistant Professor at Godhra, Gujarat University in 2001. He is a Microbial Biotechnologist with diverse research interest. A group of research scholars is working under his guidance on the areas ranging from Applied Microbiology, Environmental Biotechnology, Bioremediation, and Industrial Liquid Waste Management to solid state fermentation. My primary interest is the environment, the quality of our living resources and the ways that bacteria can help to manage and degrade toxic wastes and restore environmental health. Consequently, he is very interested in genetic adaptation processes in bacteria, the mechanisms by which they deal with toxic substances, how they react to pollution in general and how we can apply microbial processes in a useful way (like bacterial bioreporters). One of our major interests is to study how bacteria evolve and adapt to use organic pollutants as novel growth substrates. Bacteria with new degradation capabilities are often selected in polluted environments and have accumulated small (mutations) and large genetic changes (transpositions, recombination, and horizontally transferred elements). His work has been focused to assess the impact of industrial pollution on microbial diversity of wastewater following cultivation dependent and cultivation independent analysis. His major work involves isolation, screening, identification and Genetic Engineering of high impact of Microbes for the degradation of hazardous materials. He has more than 200 research publication in highly reputed national and international journals. He directs the Research program at Enviro Technology Ltd., Ankleshwar. He has guided more than 100 Post Graduate students in various disciplines of Life Science. He is an active Editorial Board Member in more than 150 highly reputed Journal’s in the field of Environmental & Biological Sciences. 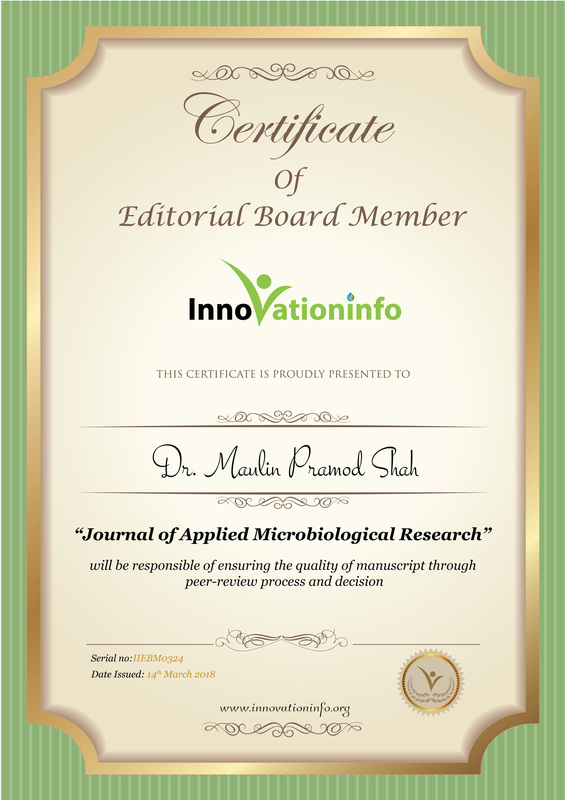 He was Founder Editor-in-Chief of International Journal of Environmental Bioremediation and Biodegradation (2012-2014) as well as Journal of Applied and Environmental Microbiology (2012-2014) (Science and Education Publishing, USA). He is also serving as a reviewer in various journals of national and international repute. Recently, he has been awarded as a Young Biotechnologist Medal by Biotechnological Society of Nepal”. He is Associate Editor in BMC Microbiology (Springer Nature), Advisory Board in CLEAN-Soil, Air, Water (Wiley), Editor in Current Pollution Reports (Springer Nature), Editor in Bulletin of Environmental Contamination & Toxicology (Springer Nature), Editor in Environmental Technology & Innovation-ELSEVIER, Editor in Current Microbiology-Springer Nature, Editor in Journal of Biotechnology & Biotechnological Equipment-Taylor & Francis, Editor in Ecotoxicology (Microbial Ecotoxicology)- Springer Nature.